Today, mankind stands at a crossroads, and the path that humanity chooses may have a greater impact on our freedom and prosperity than any event in history. In 2008, a new technology was introduced that is so important that its destiny and the destiny of mankind are inextricably interlinked. It is so powerful that if captured and controlled it could enslave all of humanity, but if allowed to remain free and flourish, it could foster unimaginable levels of peace and prosperity. It has the power to replace all financial systems globally, to supplant 90% of Wall Street and to provide some functions of government. It has no agenda. It's always fair and impartial. It cannot be manipulated, subverted, corrupted, or cheated, and it inverts the power structure and places control of one's destiny in the hands of the individual. This new technology will be looked upon as a single event — a turning point that will change the course of human history. It's called full consensus distributed ledger technology, and so far, its major use has been for cryptocurrencies such as Bitcoin, but its potential goes far, far beyond that. We could be on the verge of a paradigm shift in currency and trade that could put places like the Federal Reserve and other central banks out of business. In our fourth episode of hidden secrets of money we called upon the viewers to join a discussion to develop a new world monetary system, and the people that put forth the most logical and compelling arguments were the cryptocurrency and Bitcoin people. So Mike has spent the past several years learning about the technology that enables these cryptocurrencies to function. In this episode of Hidden Secrets of Money, we’re going to follow along on Mike’s multi-year journey to understanding Bitcoin and the fascinating technology that allows it to function. Suppose you’re a general set to attack a rival city. Your battalion is one of many. 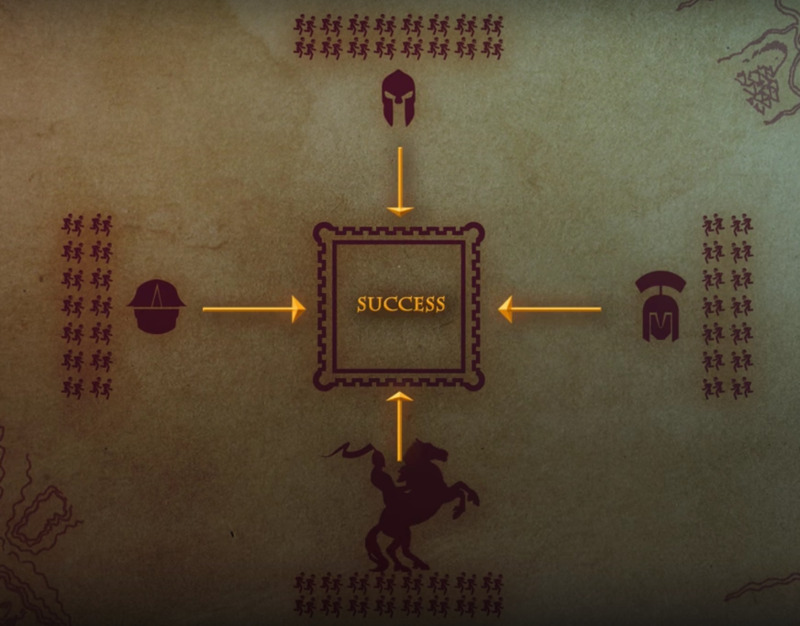 The only way for the attack to be a guaranteed success is if all the battalions launch their attack at the same time. If the advances are uncoordinated, the battle may be lost. How do you make absolutely sure that multiple parties, which are separated by distance, are in full consensus before an action is taken? In other words, how can individual parties find a way to guarantee full consensus? As stated, this problem has remained unsolved for thousands of years. At its core, it’s all about individual parties being able to trust each other directly—no strings attached. Bitcoin claims to have solved this problem. Now imagine that the battalions are actually computers on a network and that the generals are copies of a computer program running a ledger a ledger that—via some very complex math—records transactions and events in the exact order that they happened. The key here is that all of these ledgers are exactly the same for everyone as soon as a change is made on one copy. If it is proven to be true by the math, all other copies of the ledger are updated to match. What we have here is a distributed ledger that is also always in consensus. This is one of the first things to understand about Bitcoin—it is the first full consensus distributed ledger mankind has ever seen. This network can be expanded across the entire planet. It means that individual parties on opposite sides of the world can come to consensus on an event without requiring any third party as an intermediary for trust. Bitcoin was originally developed by a pseudo-anonymous developer named Satoshi Nakamoto. In 2008, Nakamoto published a whitepaper describing the technology that would later become Bitcoin. Although the original developer remains anonymous, Bitcoin retains the trust of its users by using open-source cryptography, so the source code is available for anyone to audit. You don’t have to trust the developer, you just have to trust the concepts behind the technology. In a centralized system, where someone is in control, it matters who created it because they remain in control, or they might have a secret way of controlling it. Bitcoin is wide open, and no one is in control. Everyone can see exactly how it works. Cryptocurrencies allow people to transact with each other using the internet anywhere on Earth. Instead of having an account number like a checking account or a credit card, cryptocurrencies are much more secure because they have a public key and a private key. It’s like having two account numbers—one for deposits and one for withdrawals. You’ll often see them displayed as a string of characters or a scannable code. This level of security means you could put your public key on a billboard if you wanted to, and your funds would still be secure. The only thing other people can do with your public key is send funds to you. It’s your private key that gives you access to your funds. As long as you keep control of your private key, your funds are absolutely safe, and theft and fraud are virtually impossible. But, just like cash in your wallet, you need to keep it safe in order to prevent it from being stolen. Its security is entirely your responsibility. Cryptocurrencies can also give you privacy. Just like cash, you don’t have to disclose any personal information when you spend them. By contrast, a credit card has your name, card number, and expiration date. But the equivalent of your private key, your security code and signature, are displayed in plain sight. Someday, groups of people will stand around displays of credit cards in museums and laugh at the stupidity of the systems we once used. Cryptocurrencies are light-years ahead of our current technology. Since Bitcoin was the first cryptocurrency, we’ll use it as the example as we expand on our description of a distributed ledger. Bitcoin is brand new to mankind in that it is both a currency and a payment network at the same time. And this is how Bitcoin gets its value—the immense network of computers around the world running the Bitcoin distributed ledger. Every second of every day, these computers are keeping the ledger updated and in full consensus via a system that incentivizes them to process and confirm transactions. The system that Bitcoin runs on is called Blockchain. Think of it as a modern version of an old fashioned bookkeeping ledger. But instead of a handwritten list of entries and calculations, a blockchain is a digital list of entries and calculations. A block is simply a bundle of transactions. Think of a block as a whole page of transactions in the old ledger. A blockchain is just a chain of blocks. It’s like a whole series of pages in the old-fashioned ledger. The Bitcoin blockchain actually exists in every one of the millions of computers on the network as exact copies of each other. 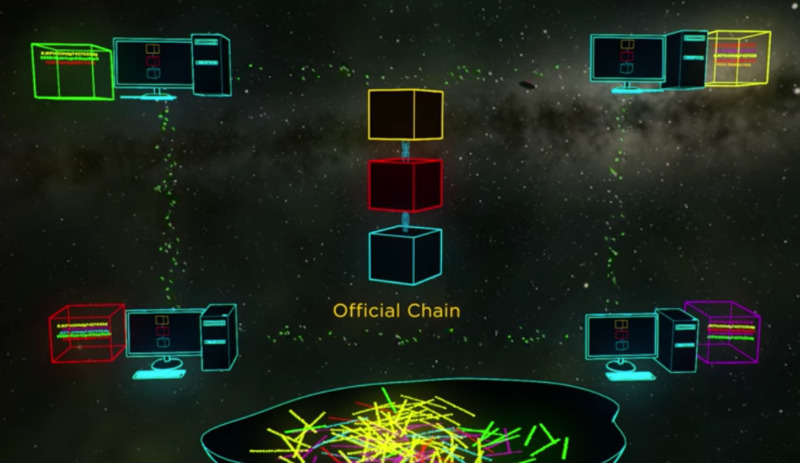 It’s displayed here as one giant blockchain in the middle of a small network of computers. When a transaction occurs, it first appears on the network in a pool of unconfirmed transactions, along with thousands of others from around the world. Millions of different computers from the network then gather some of these transactions and place them in their own blocks. The computers are all creating blocks constantly in the hope that theirs will be the next one added to the official chain. A new block is added to the chain every 10 minutes or so when one of the computers wins the right to have its block recognized as the next block in the chain and is rewarded with a prize of newly created bitcoins. The way a computer wins the prize is by trying to guess the answer to an extremely difficult math problem. In fact, the problem is so difficult that even with millions of computers making billions or even trillions of guesses every second, it still takes roughly 10 minutes to find the answer. Once one of the computers guesses the right answer and wins, all of the millions of computers that did not win are instructed to throw away all the work they have done, update their ledgers with the block from the winning computer, and start again with a new math problem. In doing so, the computers use an immense amount of power and cost a literal fortune to run. So why do they do it? Because it can be very profitable. This is where the term “mining for Bitcoins” comes from. Instead of striking gold by mining for precious metals in the wilderness, these computers are hoping to strike Bitcoin by mining precious numbers on the Blockchain. But when these millions of computers are selecting transactions to go into their blocks, they’re not all selecting the same transactions, and not all the blocks are the same size– some contain more transactions, some contain less. When blocks are thrown away, the transactions they contain go back into the pool of unconfirmed transactions. This means that the probability of a transaction being confirmed, and staying in the order it was confirmed in, is not absolute. But it becomes more of a certainty every ten minutes as new blocks are added. In fact, for very large transactions, it’s suggested that you wait for 6 or more blocks—about 60 minutes—to be absolutely certain that a payment is permanent. Interestingly, the system is slowed down purposefully. With the insane difficulty of guessing the answer to the math problem, you would think that the odds of two or more computers winning at the same time are extremely improbable, but it actually happens quite often. This is called a soft fork, and when it occurs, all the computers in the network receive both of the winning blocks and are instructed to create a new block that will chain to the block that it received first. 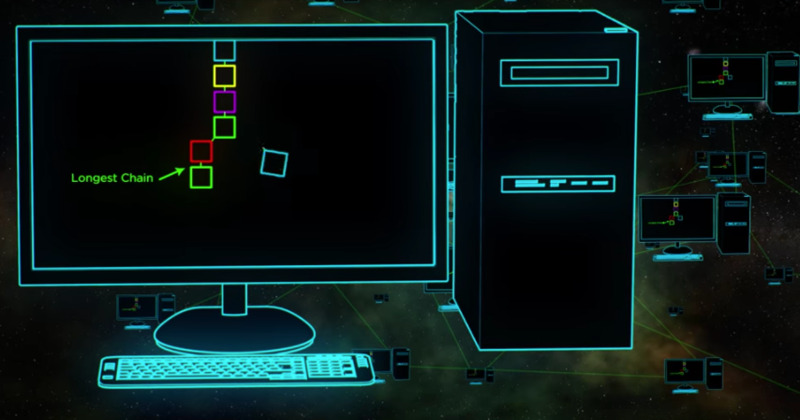 But, because of varying internet connection speeds, different computers receive different winning blocks at different times. The tie is broken roughly ten minutes later when the one of the computers solves the new math problem and its block is added to the ledger, and the longest chain wins. But what happens to all of the blocks on the other side of the fork? They’re discarded, along with all the transactions they contained, which go back into the pool of unconfirmed transactions. This “soft forking” is the main reason the system must be slowed down on purpose via the math problem. If the system was instant, it would be forking everywhere, all the time, and there would be no consensus. No one would have any idea of which ledger was the correct one, and every computer would be creating a different block to create yet another fork. The slowness and the immense amount of computing power is required to keep the Bitcoin ledger in full consensus. Therefore, as more and more computing power is added to the network, the system automatically adjusts to increase the difficulty of solving the math problem, which then requires even more power. If Bitcoin is ever going to be widely used, it would be using a massive amount of the world’s energy. Bitcoin is working as intended and allows people to transact with each other, using the internet, anywhere on Earth. 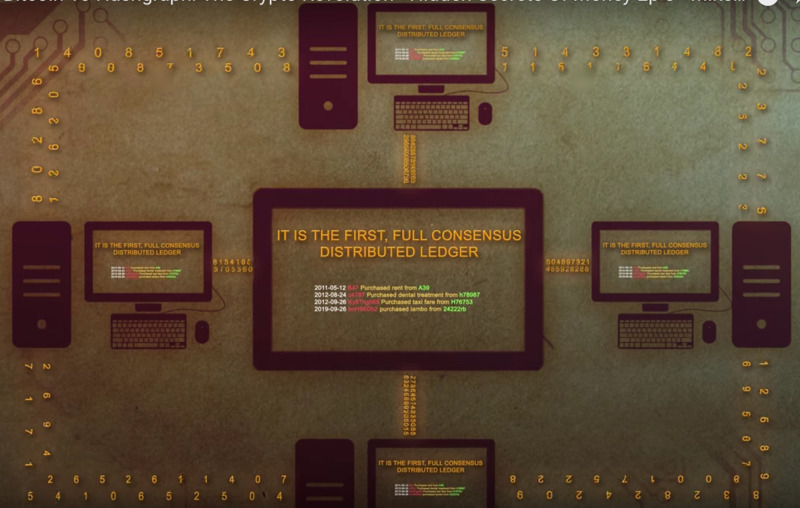 It’s the first full consensus digital ledger mankind has ever seen—but it’s not the last. Many people don’t know this, but the Revolutionary War was a war fought to free themselves from regulation, from government intrusion on their lives, from too much taxation. The founding fathers were fighting for liberty and freedom. At the end of the war, George Washington was in control of the armies of this continent, and could have crowned himself emperor. Instead, he chose to resign his commission and retire to private life, giving us this gift of a free republic. 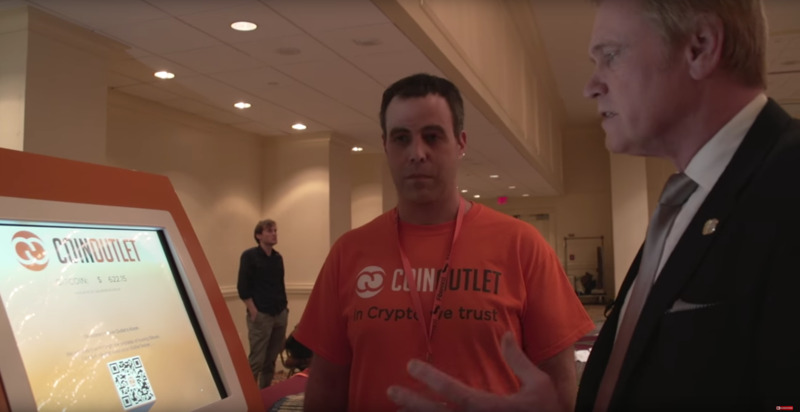 Many Bitcoin and cryptocurrency enthusiasts are worried about government regulation. The government can’t actually stop transactions, but they could punish us afterward and make cryptos less likely to be used by taxing their use. Cryptocurrencies are a technology that could free humanity. If this battle is lost and governments do succeed in trying to regulate cryptocurrencies, it would be like losing the Revolutionary War. This stands for everything the founding fathers stood for—the belief in freedom, liberty, and the individual choice and responsibility for your own actions. What are the Weaknesses of Bitcoin? 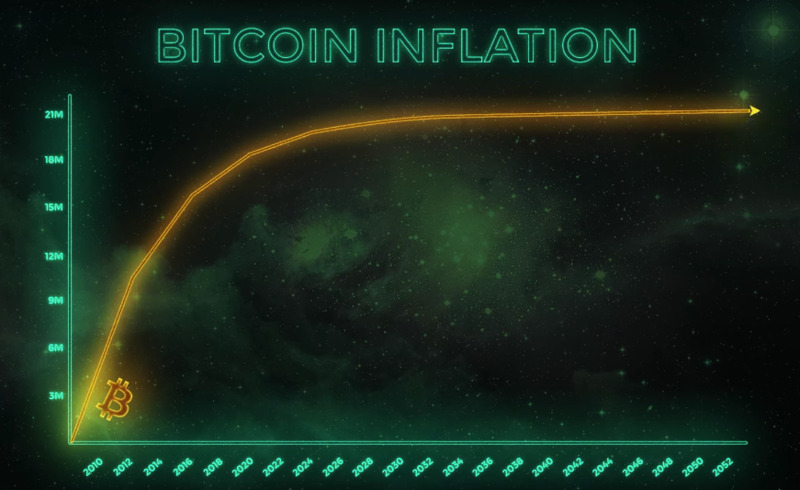 Bitcoin is a deflationary currency. In a deflation, like the one that occured in the late 1920’s during the Great Depression, velocity slows down because your currency will be worth more tomorrow than it is today, so people have a tendency to hoard currency in a deflation. Bitcoin is going to have so many coins per month released, and then that level drops every four years until it reaches 21 million coins and it stops. When that happens, there may be less of an incentive for people to “mine” because there are no new coins rewarded. This could mean fewer confirmed transactions per day, and the pool of unconfirmed transactions would increase significantly, especially if the velocity of Bitcoin transactions increases. Price is supported by speculative sentiment. Markets are forward pricing mechanisms. People are looking at the information, and they’re buying on the basis of what they believe other people will do in the future based on that information. The economic side of Bitcoin is probably the weakest, that’s why we need a lot of these alternative cryptocurrencies. Bitcoin and cryptocurrencies are still an experiment. Bitcoin and other cryptos are still largely untested. There aren’t many people in the world who understand how to build a cryptocurrency, which is a weakness because those people control the cryptocurrency market. If cryptocurrency is going to become mainstream, we need more developers who understand the technology behind it. Bitcoin and other cryptocurrencies operate on a mathematical formula that is fair, honest, and impartial. This is more than just a digital currency. It’s not just for sending value from one person to another. This is a revolution that will change the world. It will tear down boards, connect the globe, and be as important of an invention as the internet was. But because it connects people, because it frees people, there will come a day where there is a call to regulate it—to stop it, to shut it down possibly. The people who are calling for those things… Their motives need to be questioned because they are trying to prevent freedom. The people who will be calling for its regulation will be the financial sector central banks, governments—because it provides for a lot of the things that government and the financial system does very poorly, Bitcoin does them very well. It’s fair, honest, impartial, instant, and cannot be subverted. The only caveats are that Bitcoin has first-mover advantage. It’s the largest one, but it may not be the one that succeeds. It’s an experiment at this point. But the important thing is that the genie is out of the bottle. Freedom is on its way. We can all support it, or we can let it languish. Should you sell all your gold and silver and convert it to Bitcoin? Absolutely not. There is a possibility of some sort of catastrophic failure. Right now, it has proven very robust and unhackable, but you don’t know what’s going to happen in the future. Keep in mind, the Germans created the enigma machine during WW2 to encrypt messages. It was supposed to be unhackable, but we figured it out. Then they added another dial, adding multitudes of complexity, and we cracked it again. Bitcoin may be the answer to all of mankind's problems when it comes to a simple medium of exchange, but it’s more than that. You can make these smart contracts that settle with a specific set of rules. You can create escrow payment accounts. All this with no frictional costs involved. This adds up to efficiency, and overall, mankind ends up with more prosperity. If there’s no third party in-between bleeding off economic energy, YOU end up with more prosperity. This is a very good thing for all of us. And because it’s so fair and impartial, there’s less of a need for the court system, government, and rules and regulations. In the future, there will be less need for Wall Street. You can attach stocks, bonds, and the like to cryptocurrencies. And companies could now do IPOs just on the internet—they don’t need Wall Street anymore. They don’t need a third party or some other brokerage house taking a cut. There’s no need to worry about corruption, because the code cannot be corrupted. Investing in Bitcoin and cryptocurrency is a vote to support the movement and help to push the freedom of mankind forward. People buy Bitcoin for the same reasons that people buy gold and silver—it’s an alternative to all the other currencies, the fiat currencies, that are being printed into oblivion on this planet right now. They eliminate the need for third-party trust. So the reasons are the same. We would encourage every precious metals investor to investigate Bitcoin and other cryptocurrencies, and we encourage every cryptocurrency user and investor to investigate precious metals. We recommend holding both precious metals and cryptocurrencies. If you’ve invested in cryptocurrencies already and feel an urge to divest into a more tangible asset, consider trading some of your bitcoin to buy gold. Whether you believe in the potential or not, we think Bitcoin and cryptocurrencies have proven at a minimum that they must be taken seriously. All investors would be wise to ensure they understand the phenomenon. • Leemon Baird: Hashgraph - Fast, Fair, Secure... with Consensus for Free, Hashgraph in a Nutshell, The Distributed Ledger Crash Course, Could Bitcoin Cause Global Warming?